HEVC : how long before it hits the mainstream? Analysts are beginning to argue about when HEVC will reach the mainstream market. Frost and Sullivan thinks that a critical mass of adopters could take 3 years and that it may be at least 5 years (2018) before consumers see widespread HEVC support in their electronic devices. On the other hand, Ryan Lawler of Techcrunch expects devices with HEVC support to become widely available in around 18 months, with rapid adoption thereafter. Many chip manufacturers have been closely involved in the standardisation process for HEVC and are already gearing up for production of HEVC-compatible devices. Will the performance gains offered by HEVC be enough to prompt device manufacturers, service providers and users to switch over to the new standard? If so, how quickly will the shift happen? What do you think? "Geneva, 25 January 2013 – A new video coding standard building on the PrimeTime Emmy award winning ITU-T H.264 / MPEG-4 AVC was agreed by ITU members today". 2 billion HEVC devices by 2016? A market research report by MRG estimates that there will be more than 2 billion HEVC-compatible devices by 2016, with the biggest adoption rates likely to be in the mobile / internet market sectors. You can read the news release here. The Joint Collaborative Team on Video Coding (JCT-VC), a joint effort of the MPEG and VCEG standardisation committees, is developing a new video coding standard known as High Efficiency Video Coding (HEVC). HEVC is expected to be published as an International Standard in 2013. I'll be at the Consumer Electronics Show in Las Vegas on 6th and 7th January 2011, with a demo of the new OneCodec concept (beamshare.com). If you would like to meet me, let me know ([email protected]). The JCT-VC have specified the first version of the Test Model for the new HEVC standard. The Test Model, HM1, will gradually evolve into the final version of the new standard as coding tools are evaluated + added to it. I've posted a summary here together with a link to the JCT-VC document site. So far, indications are that HEVC will deliver around 2x better compression compared with H.264/AVC, at the expense of a big increase in computational complexity. By the time the new standard is published (around 2013), the hope is that this increased complexity will be well within the capabilities of consumer devices. There will still be many people who question the need for a new video coding standard. That's why we are developing the Beamshare concept, so that you can deliver improved video coding performance as and when it's needed, without the high cost of switching over to a completely new standard. A free web seminar on H.264 & how to get the best performance. I'll look at coding options, the effect they have on compression and computation and how an H.264 codec can make "good" coding choices. Sign up for my next webinar, "getting the best out of H.264", a one-hour presentation on 17th Nov 2010 at 4.30pm GMT (that's 8.30am Pacific time and 11.30am East Coast time in the US). It's free to attend and you get the chance to ask questions during the talk. What will be the next significant development in TV technology? Electronics manufacturers are investing heavily in 3DTV, hoping to capitalise on the success of 3D movies such as Avatar. However, there are indications that consumers are not in a hurry to buy 3D television sets. According to some reports, Internet Enabled Television, IETV, shows signs of being much more popular with consumers. I'm in Boston, giving a talk at the Embedded Systems Convention on Wednesday 22nd September at 4.30pm, with my colleague Maja Bystrom. We'll be talking about our work on Configurable Video Coding. By exploiting the increased flexibility of programmable processors, a configurable video codec can handle multiple video formats using a single coding “engine”, making efficient use of system resources and reducing the time-to-market for new systems. I'll be at ESC on Tuesday 21st and Wednesday 22nd September. After the talk is over, you will be able to re-play it using the link. Work is continuing on the new video coding standard, currently known as "High Efficiency Video Coding" (HEVC). A Joint Collaborative Team on Video Coding (JCT-VC) has been set up by ISO/IEC MPEG and ITU-T VCEG. Following a Call for Proposals in January, 27 proposals were submitted to the first meeting of the JCT-VC in April. Elements of some of these proposals have been combined to develop an initial Test Model, a starting point for development of the new standard. The initial Test Model has similarities to earlier standards such as H.264/AVC, including block-based intra/inter prediction, block transform and entropy coding. New features include increased prediction flexibility, more sophisticated interpolation filters, a wider range of block sizes and new entropy coding schemes. Coding performance varies across the different proposals. It looks like we might expect to see a 2x compression improvement compared with H.264/AVC (i.e. half the bitrate at the same visual quality), at the expense of a significant increase in computational complexity (perhaps 3x or more). You can find the technical proposals here. "I have a question regarding 'SKIP' block coding. When is a block decided to be "SKIPPED". What are the criteria and how is the SKIP macroblock coded?" A SKIP macroblock is a macroblock (16x16 displayed pixels) for which no information is sent to the decoder - i.e. no coded coefficients, no header and no prediction information. In H.264, an encoder can choose SKIP mode for a macroblock in a P- or B-slice. The decoder estimates a motion vector for the skipped macroblock from neighbouring coded macroblocks and uses this to calculate a motion compensated prediction for the skipped MB. Since there is no residual, the motion compensated prediction is directly inserted into the decoded frame or field. It's up to the encoder to choose whether to code or skip a MB. Typically the encoder might choose SKIP when the rate-distortion cost of SKIP mode is lower than any coded mode, i.e. when a weighted combination of bitrate and distortion (the quality loss of the decoded MB) is lower. The encoder may also "guess" that SKIP mode is suitable using other criteria such as local scene statistics, in order to save computation. I'll be in the SF Bay / San Jose area from 26th-29th April 2010, visiting the Embedded Systems Conference. Please get in touch if you are interested in meeting me. I've made the final corrections to the proofs of my new book, "The H.264 Advanced Video Compression Standard". Hopefully it'll appear in May 2010. You can find some more information here. If you have any questions about the new book, please let me know. New book - ordering info. Apart from chapters 2 and 3 (video quality and video compression concepts), the material has been completely rewritten. 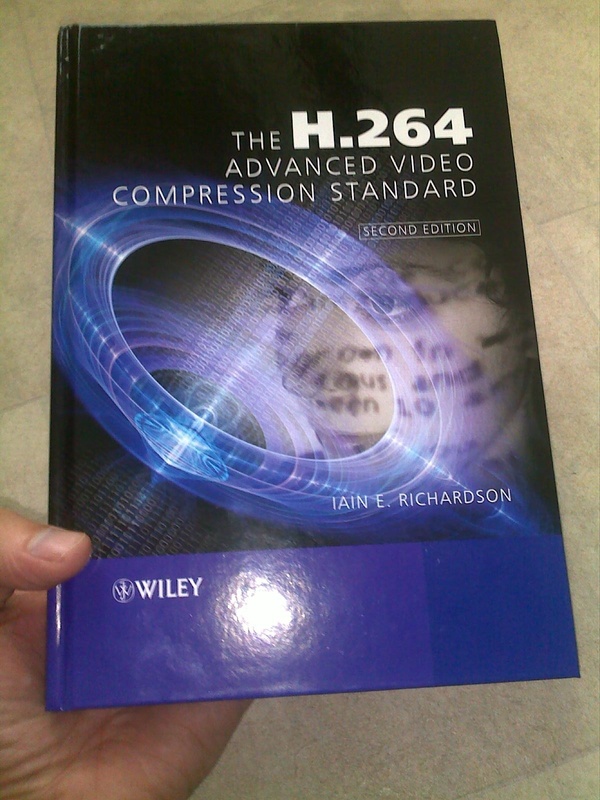 Chapters 4-7 cover the H.264 standard in detail and chapters 8-10 cover performance, implementation and extensions. Please get in touch if you have any questions about the book. I'll be at the Consumer Electronics Show (CES) in Las Vegas on 9 and 10 January 2010, then at the ICCE conference to present a paper on our configurable video coding work. If you're at CES and would like to meet to discuss video coding technology, let me know. A new video coding standard by 2013? MPEG have set out a timetable for development of a new video coding standard, currently known as High Performance Video Coding (HVC). A formal Call for Proposals will be issued in January 2010 and registration, submission and evaluation of proposals will take place from February to April 2010. The aim will be to show significantly better coding performance than H.264/AVC. The best technical features of the proposals will be incorporated into a Test Model, a working reference codec, in late 2010. A new standard could be published in 2012/2013. The new standard is likely to deliver better compression performance for current and emerging video applications, probably at the expense of increased computational cost.